By LUDWIG VON KOOPA - Did anyone dress up as Hillary for Halloween, or is that redundant with dressing up as a witch? Today was one of the worst days of the year, Halloween. Yippee. Everyone is celebrating the scary & spooky. But I think that we should avoid that kind of thing, not champion it. Keep it under the bed... and out of the White House. What makes Hillary Clinton such a scary proposition? Besides being wrong on just about every policy front, she's particularly wrong about foreign policy. And, in terms of changing the hearts and minds of Hillary supporters (though, many are just doing it because “FIRST WOMAN PRESIDENT OMG!”), I think the best point to use is that foreign policy. Particularly the certainty that she will be the catalyst for World War III. By LUDWIG VON KOOPA - Will nothing stop Nintendo's money-hungry venture into the corrupt world of smartphone gaming? As bothered as I am by GameSpot authors Chris Pereira and Mat Paget not putting the accent in Pokémon, I figured this article pretty much writes itself, and I could use something that writes itself as I have to publish something late Friday night. In an interview with Bloomberg, Nintendo president Tatsumi Kimishima (finally, after a year, I can remember how to spell his name without looking) said that Shigeru Miyamoto's team is working hard to make Super Mario Run as popular as Pokémon GO is. To my delight, Pokémon GO is rapidly declining in popularity, but it's still the most downloaded game of the time period, and the fastest revenue-generating mobile game in history. I suppose that's a desirable goal for Super Mario Run if you're Nintendo. Popularity comes at a cost, however... including the cost of human life. Discover the Final Evolutions of the Starter Pokémon in Pokémon Sun and Moon! By LUDWIG VON KOOPA - Not only do we get the starters, but Tapu Koko's friends. You know, Pokémon Sun and Pokémon Moon come out in just three weeks, so pretty soon we won't have these weekly news updates for you. On the bright side, you can play the actual game. We have known the first forms of the starters for a while, and recently we learned the middle forms of the starters. At last, we can finally learn the final forms of the starters. 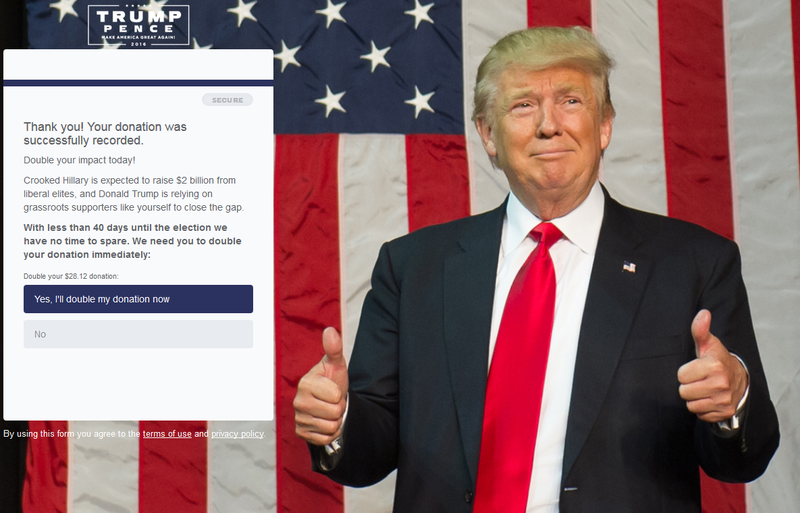 Now that you've got all the information you want, and you can make an informed decision. ...Well, as long as you watch this trailer put out today by The Pokémon Company International. I can say with confidence that I am still on Team Rowlet. By LUDWIG VON KOOPA - Game mechanics and a little strategy. It has been almost a year since KoopaTV's 2015 PC game, Capture the Confederate Flag, came out, which you can play here for free. It is a game with a lot of depth to it and a lot of player freedom, which is unlike the previous two games for KoopaTV we've produced. As a result of its relative complexity, I think it's deserving of a strategy guide detailing all of that. We're going to start with THE BASICS here, including what the objective is, along with controls and mechanics. This series will continue after this part, and this part gets more spoiler-y as time goes on. Here is Part 2 of the Capture the Confederate Flag Strategy Guide, featuring a tour through the states, and the Secret Power move that goes with them. If you haven't played the game yet, you probably really should get around to doing that. Not sure what you're waiting for. By LUDWIG VON KOOPA - Is it a question of negative coverage, or desperately trying to have any coverage? We are less than a week after having watched and analysed the first-look trailer for Nintendo's new system, the Nintendo Switch, which is coming out March 2017. That's only five months away, folks. While some people believe that's a looooooong time away, I look back at five months ago and see that's when we annexed Alberta and had our three-year anniversary. I mean, for me, it feels like that JUST happened. Why, they'll run stupid headlines like this one from IGN: Nintendo Switch Not Backwards Compatible With Physical 3DS or Wii U Games. By VORTEXICA - TL;DR: It's good. Go see it if you get the chance. In a previous article, I talked about how important music is to the Legend of Zelda series, and mentioned that it even has its own concert tour known as Symphony of the Goddesses. Well, talking about all that in such detail put me in exactly the right mood for a big ol' Zelda gaming binge. So much so in fact that I also went right out (13 days later...) and snapped up a ticket for my closest performance. By LUDWIG VON KOOPA - I... really am at a loss for words on this. This may be the most pressing and relevant embedded-YouTube-video-then-react article in the past quarter for KoopaTV! For many months, people have incessantly been demanding news from Nintendo about the Nintendo NX, demeaning any other announcement from the company as irrelevant. Personally, I'm still satisfied by my 3DS and Wii U, so I never understood why people got so worked up over the lack of official NX news. Now that I've watched the trailer, read the press release, and then watched the trailer again while making notes, here are my official first impressions about the Nintendo Switch! Playing the Pokémon Sun and Moon Special Demo Version! By LUDWIG VON KOOPA - Little did I know the part before the page break would be the best part of the experience. Remember when I was groaning about the Pokémon Sun and Pokémon Moon SPECIAL DEMO that was announced two weeks ago, that nonsensically will feature Ash-Greninja? Well, that future-tense is now present-tense, and that Special Demo Version is now released! According to Nintendo's official website (where you can download the Special Demo Version, along with the Nintendo eShop on your Nintendo 3DS), it gets its own set of italics as a full-fledged, separate product. Well, I'm downloading it now. It's 3058 blocks (apparently about 382 MB, if you care), and free, of course. The icon is this cool-looking Poké Ball that has its top part split between red and blue. It took me only 5 minutes to download! 3DS Home menu theme for downloading the Apollo Justice: Asinine Attorney DLC. You not only can transfer Ash-Greninja to your full copy of Pokémon Sun or Pokémon Moon, but also other stuff, when you buy it when it comes out in a month. What kind of stuff? Well, I'll find out when I play the demo! Which I'll start doing right now, and the rest of this article will be my reactions to it. By LUDWIG VON KOOPA - And there shouldn't be. For decades, Nintendo gamers have always declared their belief in “gameplay over graphics.” That said, before the Wii, Nintendo console systems were always ahead of, or met the graphical standards of, gaming consoles of the day. But if you go back another decade before the Wii, you were in the fifth generation of consoles: The 32-bit/64-bit era of the mid-1990s and on. This was when consoles were just starting to enter 3D graphics, slowly leaving behind the 2D stylised sprites of the 8-bit and 16-bit eras. 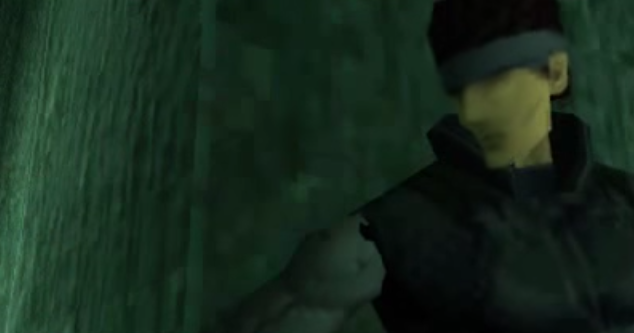 This was when consoles were boasting so-called realism in graphics. I admit that not having facial features helps your stealth out. That's why so many characters back then had gloves incorporated into their character designs. It makes character modelers’ jobs a lot easier when working with hardware that can't render individual fingers. So, take this thought experiment: Indie developers love to have their games in 8-bit or 16-bit styles. Could an indie game possibly sell well if they purposefully go for 32-bit or 64-bit graphics? Did you think about it? Want to know my answer? Meet Silvally, Tsareena, and Others in Pokémon Sun & Moon! By LUDWIG VON KOOPA - Going back to a 10-year old debate, and looking ahead to a new beauty. It's been a whole week since the last article on Pokémon Sun and Pokémon Moon, when the evolutions of the Alola Starter Pokémon were revealed. You know the game comes out in a month, right? It's the last unreleased game of the year that KoopaTV has dedicated a lot of focus on, so yeah, you should expect that we pay attention to it. Meanwhile, I expect that YOU will pay attention to this trailer released today by The Pokémon Company International. All of the new names to learn: Silvally, Hakamo-o, Kommo-o, Steenee, Tsareena, Ribombee, Alolan Grimer, Alolan Muk, Olivia, and Ilima. So, what have we learned about Silvally? By VORTEXICA - Watch the first episode here! We've had lots of quality video material coming out lately to complement our articles, but now Rawk's not the only one making new audio-visual content for KoopaTV. Brought to you by Tea Storm Studios (that's me), on a budget of about 50p, the debut episode of an all-new photo comic video series: KoopaTV Adventures! Fiction Can Influence so Please Stop Overshadowing Girafarig (Also Pictures From My Vacation)! By SHINYGIRAFARIG - You can see how much I am obsessed about giraffes here. Last month on September 14, 2016, I traveled from New York City to San Francisco, California, for a babymoon with my husband. So why have I chosen California as a place for a vacation? Well, let's just say that I was influenced by Splatoon and their adorable interpretation of squids. I wanted to see live ones up close, but the problem is that there are barely any aquariums that have them. An aquarium I contacted said they have a very short lifespan so it is considered not worth it to have them. I also read somewhere that they are very high maintenance — so a combination of short lifespan and high maintenance means aquariums do not want to devote their funding for them. I did land on one of the few aquariums in the U.S. that has them, the Monterey Bay Aquarium. By LUDWIG VON KOOPA - Buy Paper Mario: Color Splash, and join the bucket of deplorables! We have been writing at least one article about Paper Mario: Color Splash every week for, like, months now. The game is finally out today, October 7. I picked up a physical copy today (after wisely pre-paying for it online October 6), and Rawk downloaded a copy off of the Nintendo eShop. We're both having Miiverse adventures with it. “The future of the series is bright! We have similar immediate impressions. We're really upset that there is only one save file per NNID, and the process of selecting and using Battle Cards is pretty clunky. However, the dialogue and writing is consistently amazing, with gems in every conversation. The in-game instruction manual (which can't be shared to Miiverse) even has great writing... and it has MUSIC, too. It's the kind of instruction manual, in terms of design and irreverent content, that hearkens back to the physical quality instruction manuals of old. Huge fan of that. Assuming we can accurately extrapolate this trend of excellent writing, great graphics, great music, and mediocre gameplay for the rest of the game (...that's a dangerous extrapolation to make, but just for the sake of discussion), that's certainly more than enough to have this be the best Wii U game of 2016. There's not much competition there, but it's true. As long as Paper Mario: Color Splash isn't trying to be a movie, that combination is still appealing to us KoopaTV staffers. that basic reading ability is required to enjoy the game. But hey, it's enjoyable. 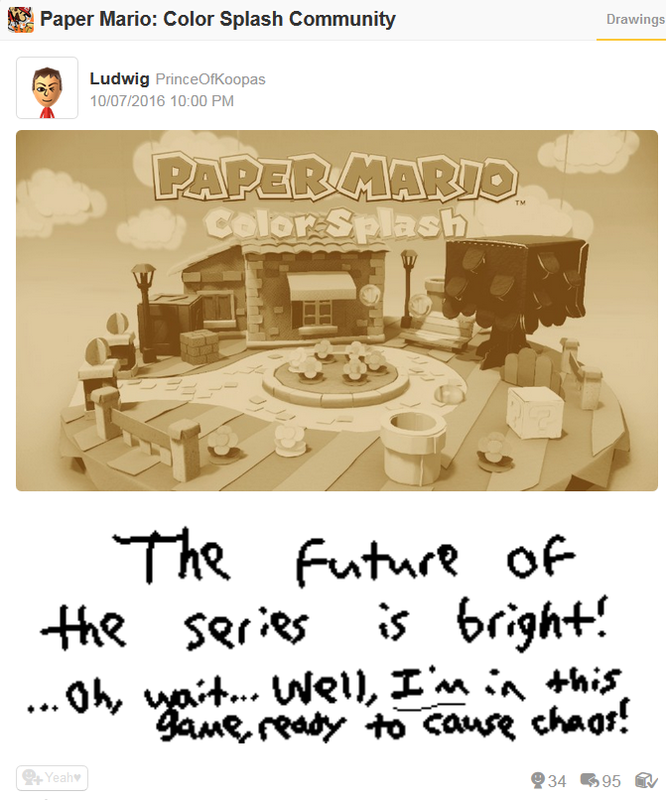 You could argue that Rawk's and Ludwig's perspectives on what makes a game good are deplorable in the comments section, but either way, you should still buy Paper Mario: Color Splash. If you can get it for less than $60, that's even better. To know what that Shinzō Abe reference in Rawk's Miiverse post is referencing, click here. Click here for a full review of Paper Mario: Color Splash! Mid-Evolutions of the Starters in Pokémon Sun and Moon! By LUDWIG VON KOOPA - PLUS, massively multiplayer online-esque quests. You haven't forgotten Rowlet, Litten, and Popplio, right? Good, because now they have evolved one time each. While not every KoopaTV staff member who originally took sides on their favourite Alola starter is available to comment (in fact, none of them besides me are available as of writing this paragraph), I'll speak for myself. I still want Rowlet. Badly. Believe me. And Dartrix strengthens my starter Pokémon decision. He's a significant improvement over the disaster that was Quilladin. 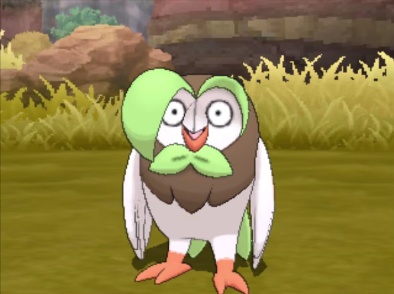 Dartrix, the evolution of Rowlet, easily looks like he could be in Animal Crossing. That's good! Paper Mario: Color Splash — Episode 7: Final Episode! By LUDWIG VON KOOPA - Swear Upon the Orange Sun Rescue V Will Never Die! I hope, on a net-basis, you all enjoyed KoopaTV's coverage of Nintendo's Paper Mario: Color Splash Rescue V web series. It was nice to see, across a period of a couple of months, people slowly reaching the same conclusions that we did about Paper Mario: Color Splash after E3. And we caught a lot of heat for that across the Internet. As usual, however, KoopaTV is on the right side of history. 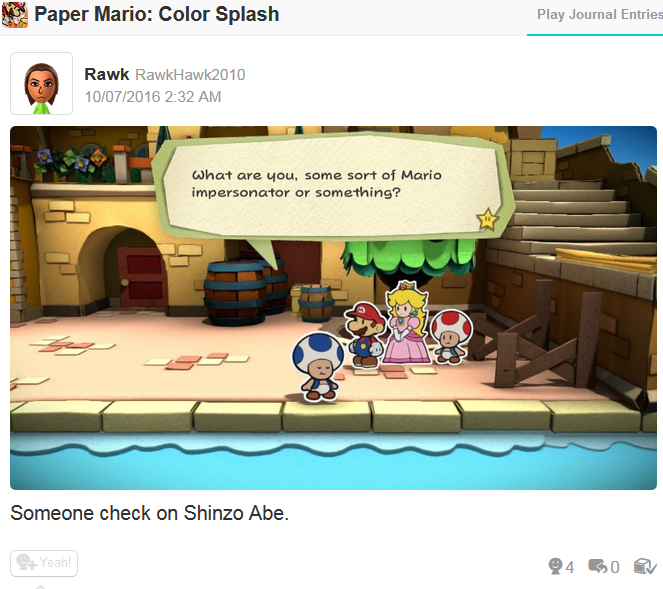 But that's the kind of language I should save for KoopaTV's review of Paper Mario: Color Splash. We must discuss the final episode of the Rescue V series, called Final Episode. It features the Chief Toad! By LUDWIG VON KOOPA - Or, as Herman Cain would put it, Pence vs. K-A-I-N-E. Both Donald Trump and Hillary Clinton looked pretty undesirable in the previous & first presidential debate. So, maybe the guy who will probably run the show for Trump (Mike Pence) and/or the guy who no one knows who he is (Tim Kaine) will be better than their respective top of the ticket? Meanwhile, Mike Pence is a movement conservative, and that includes some of the bad stuff that legislating social conservatism brings. He's otherwise solid, but that is a big hurdle. Unlike Trump, Mike Pence's personality is best described as “boring”, and could also be described as a generic white guy. By LUDWIG VON KOOPA - It turns out September was more than mere filler articles! Well, we're in October now... Getting close to the new year... and a really important event next month... Yup... Erm, right. Gotta review September. You know, if you want to be in that top half of point-earners — and remember for this month that the person who ends October in first place wins a $10 Nintendo eShop code — study the how-to-win-points section of the article explaining everything you need to know about the program. Keep in mind that you get rewarded for partaking in all of the features this site has to offer! Yup, it's on purpose that everything is tied together this way. Oh, and that points section? I just totally redid it into an embedded Google Sheets sheet. It's now set up as a table, and should be much easier to comprehend, not that anyone reported difficulties before. I plan to buff some of the activities' point-providing opportunities, such as editing KoopaTV's TV Tropes pages and referring people over, starting in Round... 11. I don't want to just change up the rules mid-round, after all. You can look at September and just think it's all KoopaTV doing a certain company's marketing for them, but hey, it was a tough choice to make to pick what goes here. Even now I'm unsure. It goes to show every article is worth reading. ...Anyway, we're going to have a very exciting set of content for you this October. Ooh, and then November... It'll all be so amazing. Do your friends a favour and share that amazing-ness that is KoopaTV to all of them. That makes everyone happier. For last month's review newsletter, August 2016, click here. For next month's October 2016 newsletter, click here. Those proposed buffs happened. For last year's September 2015 review newsletter, click here. For next year's September 2017 review newsletter, click here.